By purposefully including opportunities for practice into your school day, you can help students quickly learn how to recognize, read and spell not only their own names, but also the names of classroom friends. Here are several simple ideas for name recognition activities to get you started. Each of these are areas in your classroom that the children will need to locate on a daily basis. These daily name recognition activities offer consistent practice with minimal effort. You can also create a permanent display that incorporates each child's name, and showcases work they are proud of. For this, you will need a large area – whether it is a bulletin board, door or dedicated wall space. Cover the area with chart paper. The title of your display will be "Look What I Did!" Use letter cut-outs to spell this across the top. Next, divide the space into sections which are at least 12" x 18". If you like, you can even draw lines to create the sections – like a grid. At the top of each section, attach a place card with the first name of each child in your classroom. There will be one space per child. You can then use the spaces throughout the year to display artwork, projects, handwriting samples, and other student-created work. To find their work, the students simply need to locate their name! As children work during the year to read, spell and write their names, and the names of classmates, they can use what they see around the room as help. Name recognition practice should also be part of your morning routine. Create a simple attendance chart on a blackboard, magnetic board, wall space or pocket chart. Have a card or popsicle stick available with each child's name written on it. When students come into the room, have them find and read their name. Then, they may add it to the attendance chart to show that they are ready for the day! If you have students gather for opening activities in the morning, why not create a spot for each child to sit that incorporates their name. One way would be to simply mark a spot on the floor with masking tape. You can use permanent marker to write a name on each spot – or better yet, let the children practice writing their own names! If you have carpet, are unable to affix tape to the floor, or want more flexible seating options, consider letting the children make their own Situpons. Vinyl tablecloths and newspaper are used to create portable squares the children can grab and sit on. You can add name recognition to the mix by simply writing each child's name on their Situpon using permanent marker. After coming into class and adding their name to the attendance chart, students should then grab their Situpon, find a seat and show that they are ready to begin the day. Cut the index cards into rectangles which are 1 1/2" x 2 1/2". You will need one rectangle per letter in the child's first and last name. So, for example, the name "Brad Smitherly" would require 13 rectangles. Using one rectangle as a template, trace the same number of rectangles in two rows onto the front and back of the colored construction paper. The rectangles for the first name will be traced into the first (top) row, and the rectangles for the last name will be traced for the second (bottom) row. Repeat this for both the front and back of the construction paper. In the rectangles traced onto the front of the construction paper, write one letter in each rectangle to create the child's first and last name. Remember to use appropriate capitalization. The rectangles on the back of the construction paper will be left blank. On the rectangles you have made from index cards, write one letter on each to create the child's first and last name. Laminate the construction paper. This will become the placemat. Store the individual cards in an envelope. While students are having their snacks, they can practice name recognition, spelling and reading by using the individual cards to create their names in the squares on the placemat. 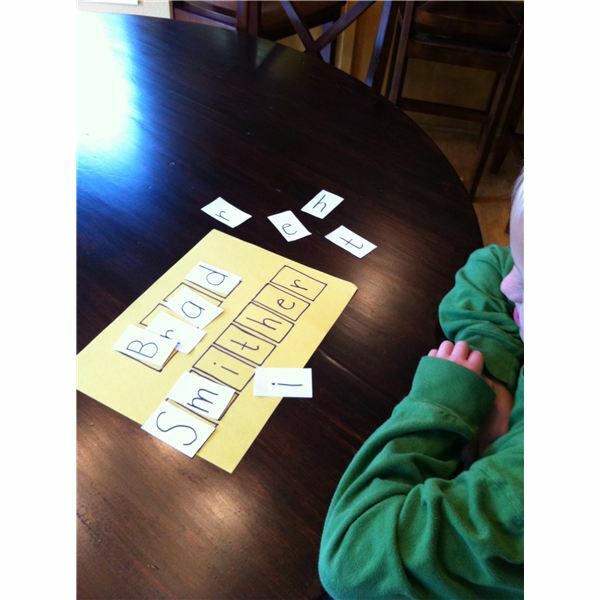 Students should begin with the side that already has the letters written in and practice matching. Encourage students to place the letters in the correct order, and not skip around. 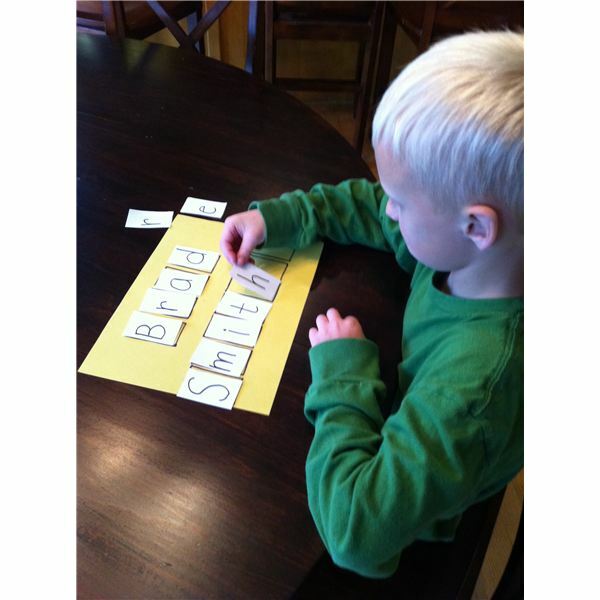 Once they have mastered this skill, they can flip the placemat over to the side with the blank rectangles and use what they have learned about name recognition to form their name. For an added challenge during the year, encourage students to swap placemats with other classmates. Do you have other name recognition activities that you have successfully incorporated into your classroom? If so, we would love to hear about them! Be sure to visit the comments section below. The ideas offered in this article are based on the author's extensive experience as a classroom teacher and homeschooler.